God said to Joshua,” Tell the priests to carry the tabernacle into the Jordan River. So it was Joshua commanded the priests to carry the tabernacle of the covenant into the Jordan. Once the priests stepped into the edge of the Jordan River, the water was cut off and it piled up as a heap. The priests bore the tabernacles and stood still in the Jordan River until all the people had crossed the river to the other side. So Joshua chose twelve men from the twelve tribes of Israel and commanded them to take a stone from the Jordan River. The twelve men did as Joshua said. They went into the Jordan River and carried a stone back to their camp. Joshua then set the twelve stones up at the place where the priests stood still in the Jordan River. The twelve stones exist until today. Joshua obeyed and took off his sandals. Then the Commander of the Lord’s army said, “Jericho is shut up because they know the Israelites are coming to attack them. I have given Jericho into your hand. Now you and all fighting warrior men shall march around the city once every day for six days. The priests that carry the tabernacle of the covenant will march ahead of you. But on the seventh day, you shall march around Jericho seven times and the priests will blow the trumpets. So Joshua spoke to the people about it. Every day, Joshua and the fighting warrior men will march around the city once. The priests who bore the tabernacle of covenant marched ahead of them. 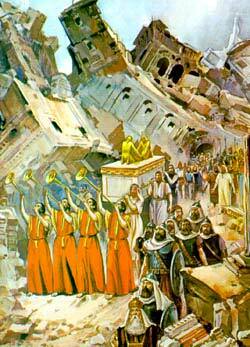 When the people heard the loud trumpet blast, they gave out a loud shout and the walls of Jericho fell down flat. The men went in and kill everyone in the city and then they burned down the city into ashes. They took the silver and gold, and vessels of bronze and iron and consecrated to the Lord. Everyone in the city was killed except Rahab, the prostitute and her family household who stayed in Rahab’s house.